Hello my loveliess! Back again today with another outfit post. 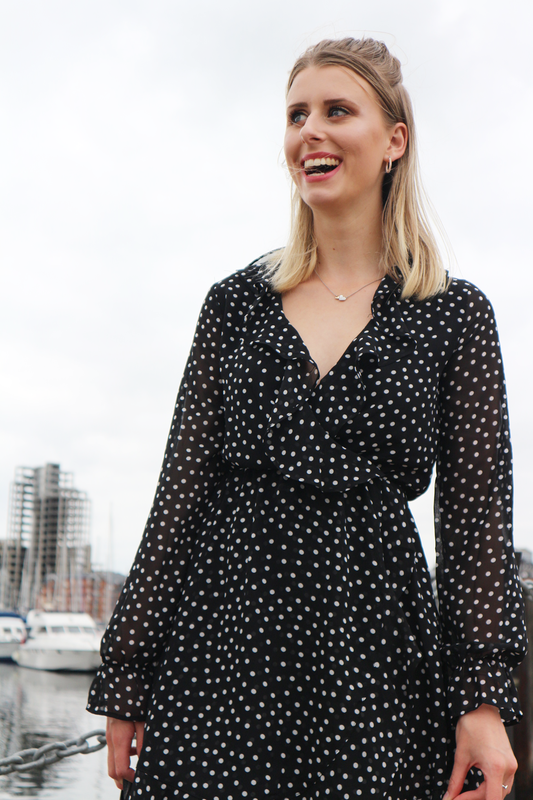 The weather in the last week hasn’t been quite so sunny so I decided to whip out this polka dot number I bought in the H&M sales a while back. It’s a bit different from my usual style but I really love it. I dressed it up with some booted heels but was tempted to go for the converse instead, what do you reckon? Despite saying the weather hasn’t been so sunny, I am struggling not to squint in all of these photos. It was that weird weather where it’s super cloudy but somehow you still kind of need some sunnies, does anyone get me?! I was thinking about these shots and realised how a few months ago I thought of shooting here, but felt too embarrassed posing in front of a camera in such an open space as the waterfront, now it hardly phases me. It sounds like such a little thing to most people but for me it is massive. Anyhooo, Jamie and I are off to London on Sunday for a night stay which I am SO excited about – I love our little adventures together. We’re planning on visiting the Science Museum and maybe the Natural History Museum too. Do you guys have any suggestions for places to go? Can’t wait to write up all about it! Shop my fave polka dot numbers below..